Another year has rolled by and with it many events have occurred. Some goals got accomplished and others did not. How did your year go? And what resolutions do you have lined up for this New Year that is upon us? Mine are all about tea, naturally! Stay true to your own tastes when it comes to tea. Sure you can get advice from me, a couple dozen other blogs, the college kid working in the local tea shop, or your Uncle Fred. But you will sooner or later need to deal with your tastebuds and your sense of smell, and they aren’t going to be happy if you don’t listen to them. Mine practically scream “Assam!” at me in the morning and then start nudging me about some Darjeeling in the afternoon, and get downright insistent in the evening for some soothing Sencha or even an herbal such as Chamomile — which brings the next resolution to mind. Learn to say “herbal infusion” instead of “herbal tea.” I know a lot of tea vendors (even the company that owns this blog) who use the term “herbal tea” and there’s nothing too wrong with that. I fuss about it because of all the people I’ve met recently who find tea confusing and even more so with all those herbals mixed in. If we all switched to calling them “infusions” instead, it might help, especially for those who want to avoid the small amount of caffeine in true tea. My two cents’ worth here! Make or buy that long-overdue Tea Princess Kit so you never get stuck having to settle for that stuff they serve in restaurants. 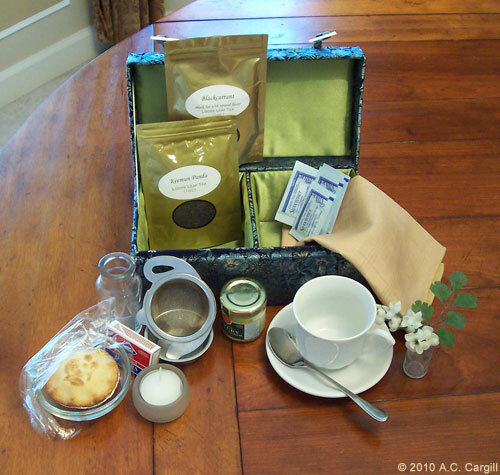 By now those of us who have been enjoying fine teas at home know that there is a total absence of anything even remotely like them to be found in most restaurants in the U.S., so bringing that kit along is increasingly essential. My personal kit is shown here, complete with a suitable treat. Since we only eat out rarely these days and then usually in certain places, the staff there have become familiar with this kit and also know to bring me water that has been brought to a full boil. Heh heh! Form a local tea club. One approach might be to have a group of your friends join you in signing up for a tea vendor’s tea club. Then, you can all gather together for each new tea that arrives to enjoy it en masse. Another is for you each to take turns selecting the next tea to try, just as you would do for a book-of-the-month club. This would be a tea-of-the-month. Whatever you choose for the New Year, may it last longer than most resolutions do and may it bring more positiviTEA to your life. Happy New Year!